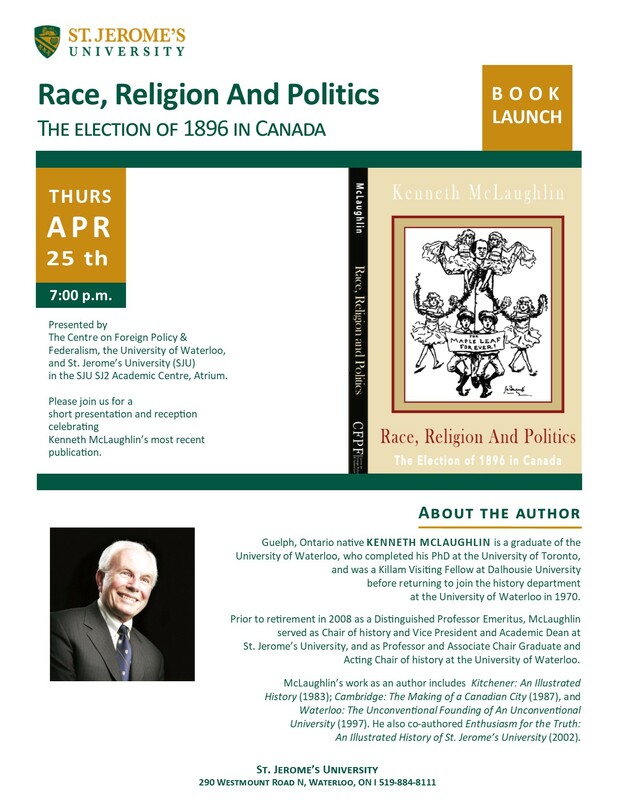 The Centre on Foreign Policy and Federalism (CFPF), located at St. Jerome’s University (SJU), is pleased to announce the release of author Kenneth McLaughlin’s book Race, Religion and Politics: The Election of 1896 in Canada. The author and book will be celebrated at a book launch taking place at the university on April 25th, at 7 p.m. in the SJU SJ2 Academic Centre Atrium. McLaughlin enlightens readers to the spirit of the late nineteenth century in Canada and explores the monumental challenge the country faced as the economy underwent significant structural change. These economic forces hastened spirited reflections on race and religion in Canadian politics and provide a refreshing backdrop to many of our contemporary national debates. The CFPF is pleased to support McLaughlin’s new book that follows other publications by the author, including Kitchener: An Illustrated History (1983); Cambridge: The Making of a Canadian City (1987), and Waterloo: The Unconventional Founding of An Unconventional University (1997). He also co-authored Enthusiasm for the Truth: An Illustrated History of St. Jerome’s University (2002). Please register your participation for this public event in advance. A brief presentation and light refreshments will be served as part of this launch.